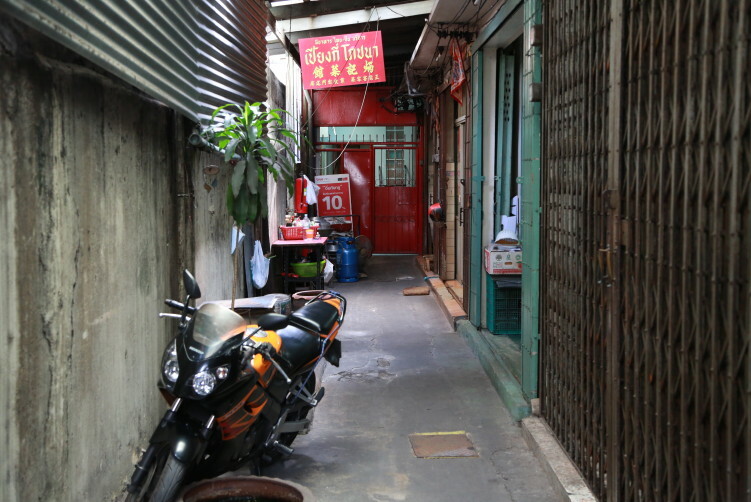 It was the colorful temple that stole my attention and made me enter Trok Wat Kuson Samakhon, a small alley between Yaowarat and Charoen Krung road in Bangkok’s Chinatown, but it was the food at Piang Kee that convinced me to go back. Even in Chinatown terms the food was far beyond any expectations, and far from most of the food you find street side in Bangkok. A lucky turn to the right just before the gate to the temple and the parking spot, a narrow path or lane I normally wouldn’t enter. Even today I’m not sure what made me walk down the 15-20 meters to discover Piang Kee at the end of the narrow alley. Maybe it was the pots for steaming food and the kitchen ingredients left alone at the end of the alley, maybe pure curiosity. What I know, is that I have never regretted that I did go down there. The small room to my right revealed a few tables, including the traditional and wooden Chinese dining tables with a spinning round plate in the middle, which made me even more curious as old wooden tables normally is a very good signal of where to find good traditional food in Bangkok. It basically means that the resto has been in operation for at least a decade or two, most likely more. In other words, customers comes back. The next thing I notice was a man sitting there alone, with his back to me, staring at a small TV. A women came into the room, smiling. Open, I asked as I felt i had to say something? She nodded. I sat down and she quickly handed me a small book with plastic folders inside, filled with photos of different dishes and the name written in Thai. In Bangkok, and even more so in Chinatown, resto’s are all about food and texture. The interior isn’t given much attention, with most of the restos being 30 years behind any modern interior trends in the west. Normally a single dining room, a small traditional shop house. A few simple tables and chairs, sometimes also used as storing facilities, walls are filled with pictures and photos, including the Royal family, different artifacts, religious symbols. And at Piang Kee you also have a piano. 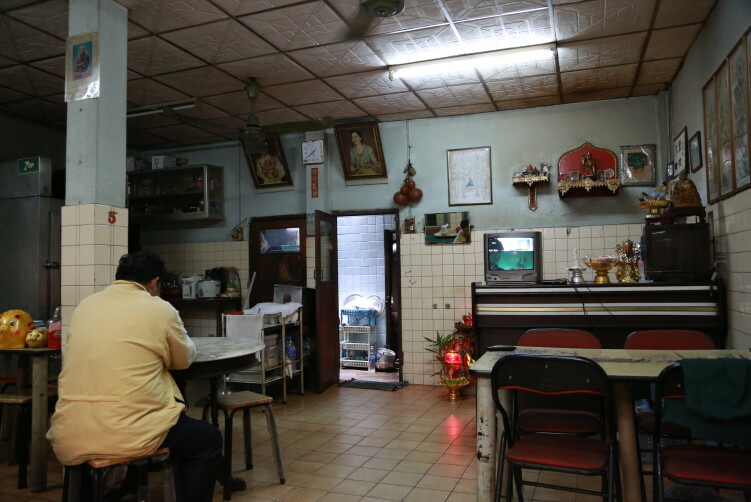 Piang Kee isn’t any exception to the typical shop house kind of restaurants, except that it bears a past, but a past that gives a pleasant atmosphere you seldom find in newer establishments with aluminium tables and plastic chairs. Piang Kee is also clean and welcoming. And I soon enough learned, they serve fantastic Hakka food. The Hakka cuisine, or Kuhchia cuisine as it’s also called, originates mainly from the southeastern Chinese provinces (Guangdong, Fujian, Jiangxi and Guangxi), but you may find it in other countries with significant Chinese communities, especially in Hong Kong, Indonesia, Malaysia and Singapore. And in 2014, Hakka cuisine was listed on the Hong Kong Inventory of Intangible Cultural Heritages. A house specialty, a very delicious one, was steamed tofu filled with minced and seasoned pork. Extremely hot when served so be prepared to wait a few minutes to dig in, if you can. When you get tofu like this, you already know they can cook. Make sure you get some of the stock on your spoon – the juices from the steamed tofu – together with the pieces of stuffed tofu and coriander. The next dish, tofu in a savory red broth, or Yen Ta Fo without noodles as I like to call it, was maybe the best Yen Ta Fo I have ever eaten. 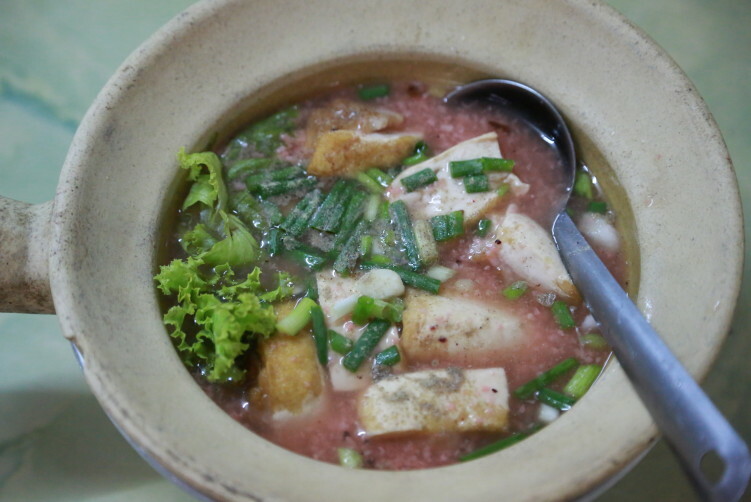 The tofu was absolutely delicious and the broth made from dark red rice (khao daeng maak) that is fermented was to die for. Strong aroma, but with a balance you seldom experience. Definitively homemade, like all the other food here. It came with lettuce and was sprinkled with shopped spring onions and black pepper. No need to start looking for the condiments here. It’s a dish that always will be on my table when visiting Piang Kee. The next dish was the pork belly served over preserved greens. I would agree with comments saying it doesn’t look like there is any greens on the plate, but it is, and it’s just surprisingly lovely. The meat and fat has a delicious smokiness and has been stewed to a really fall-apart tender texture, almost like cheese or lasagna. The fourth dish, steamed chicken, was pleasant in taste, but just a bit too dry. It came with a specific dipping sauce made of chili and salt, left to ferment over night. Pleasantly sour and spicy at the same time. The chicken was the only slight disapointment, but it couldn’t put aside one of the most impressive visits I’ve had in Bangkok over the years. The four dishes was eaten over two visits. Firstly I ate the Chicken and the Yen Ta Fo without noodles. And I would not have returned if it wasn’t for the outstanding Yen Ta Fo. But I thought it couldn’t just be a lucky shot, as the quality and the cooking skills was far beyond that. The stuffed and lovely tofu and the incredible pork belly proved me right. On my second visit I was also served homemade plum wine, a very decent and tasteful glass that suited the food. 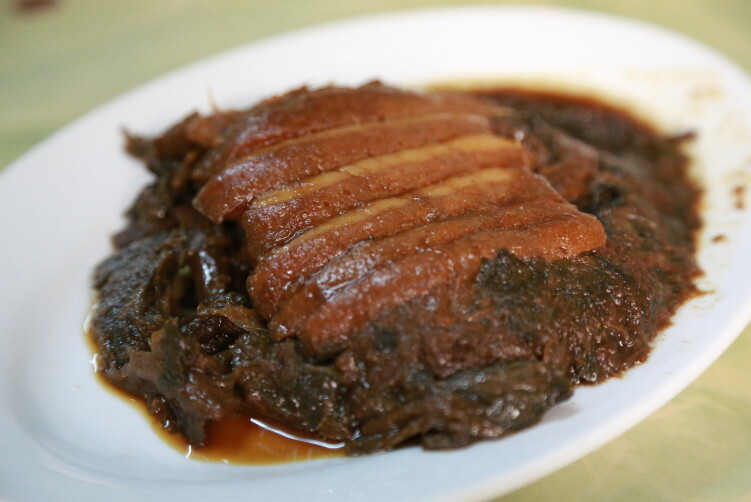 Piang Kee also have other tofu dishes like tofu “paper” stuffed with minced shrimp (fong tao huu yat sai kung thawt), or goat braised in red sauce, which I will test on my next visit. Most dishes comes with the syrupy plum sauce or the house dipping sauce which is the simple mixture of fresh chilies and salt that is left to ferment overnight. Piang Kee and their Hakka food in Bangkok isn’t anything like what can be a characterized as a good find in Bangkok. It’s definitively old-school Chinese food, but it’s much more than that, we are talking about endangered receipts and food that is doomed to disappear in the long run when style and fashion completely has taken over from quality. Piang Kee is run by a friendly and middle aged couple that put pride into their food making. It’s definitively not where you come for a romantic lunch or dinner. It’s all about good food. They are honestly interested in your opinion and they are proud when you give complements. Piang Kee was started by parents who opened the restaurant around 50 years ago when they came from China. It’s also a resto you won’t find unless you’re feeling exploratory, or you have been tipped about it. Even then it can be difficult as you don’t expect to fine anything down the small alley, and you turn around thinking it must be somewhere else. But when you find it, I can assure you will come back. The man in the house speaks some English. They have a bit of a peculiar opening hours, from 11am to 6pm, but it’s worth having an earlier dinner if that is your only option. click here Price: I Paid 380 Bath for the yen ta fo and the steamed chicken. I paid 420 Bath for the pork belly and the stuffed tofu, including plum wine. 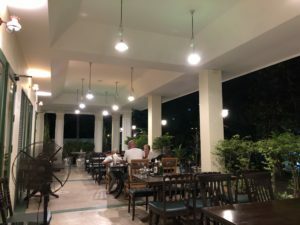 How to get there: You find it just off Ratchawong road (105-107) that connects Yaowarat Road and Charoen Krung Road (across from Grand China Princess Hotel). Look for the blue street sign saying Trok Wat Kuson Samakhon and walk into this small trok. Take right just before the gate to the temple area. You see a small red sign on the wall to the right of the gate. 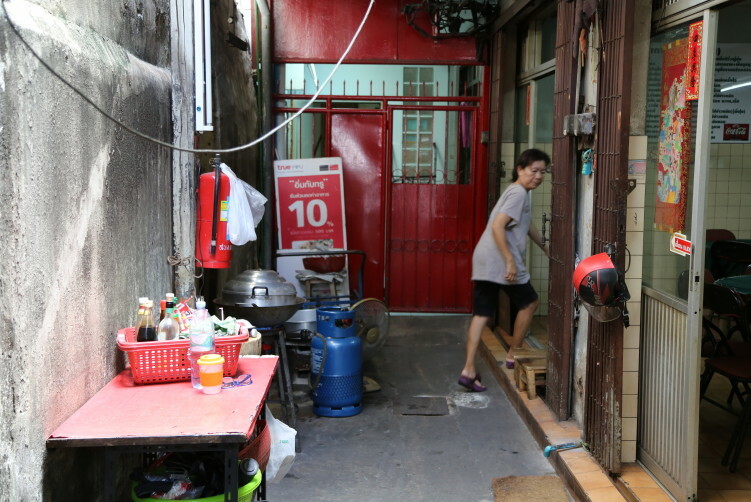 Walk into this narrow line and you find Piang Kee at the end of the lane. 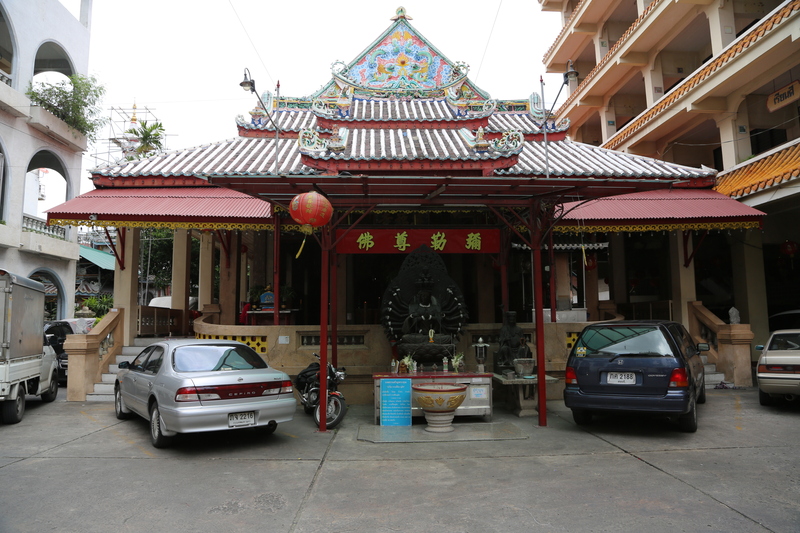 Wat Kuson Samakhon (โรงเรียนกุศลสมาครวิทยาลัย) is also called Wat Yuan where Yuan refer to Vietnamese. The Vietnamese started to migrate to Thailand in the 1700s. Chinatown in Bangkok actually has more Yuan (Vietnamese temples) than Chinese temple. A good time for visiting is in the morning when you can listen to the morning chance. It’s a small temple and you might get the opportunity to talk to the abbot and his secretary if you like. They can tell about the history, the mindset and how they look at the future, including recruitment, strategy, mission and vision – all key elements to keep moving.